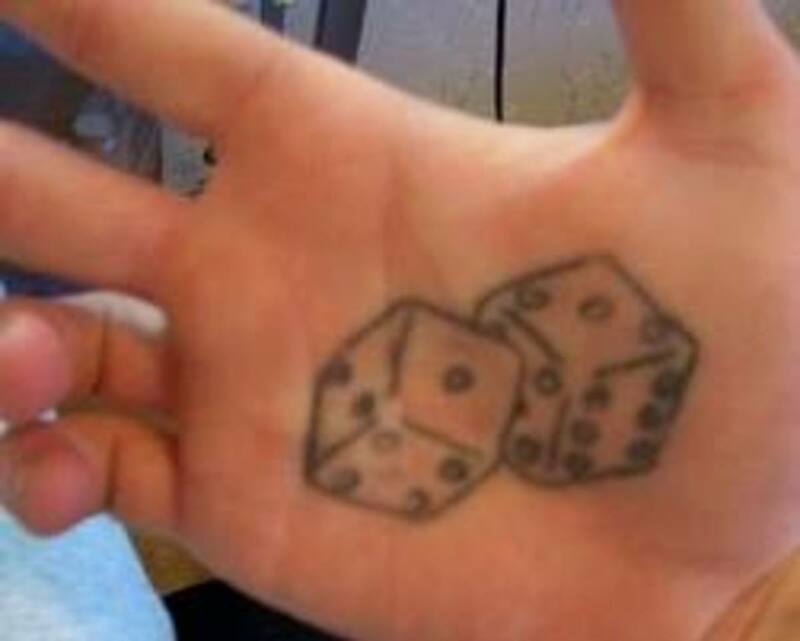 Props on your interest in the dice tattoo, a unique choice. 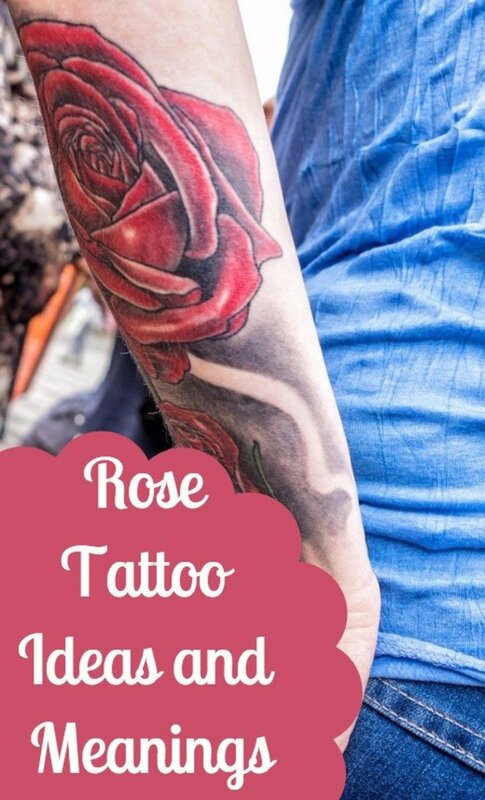 These are definitely not mainstream tattoos, yet they are still regularly requested due to their appeal to risk-takers and luck-lovers. They can be customized to any theme, include various elements and symbols to accentuate meaning, and are worn by both men and women alike. 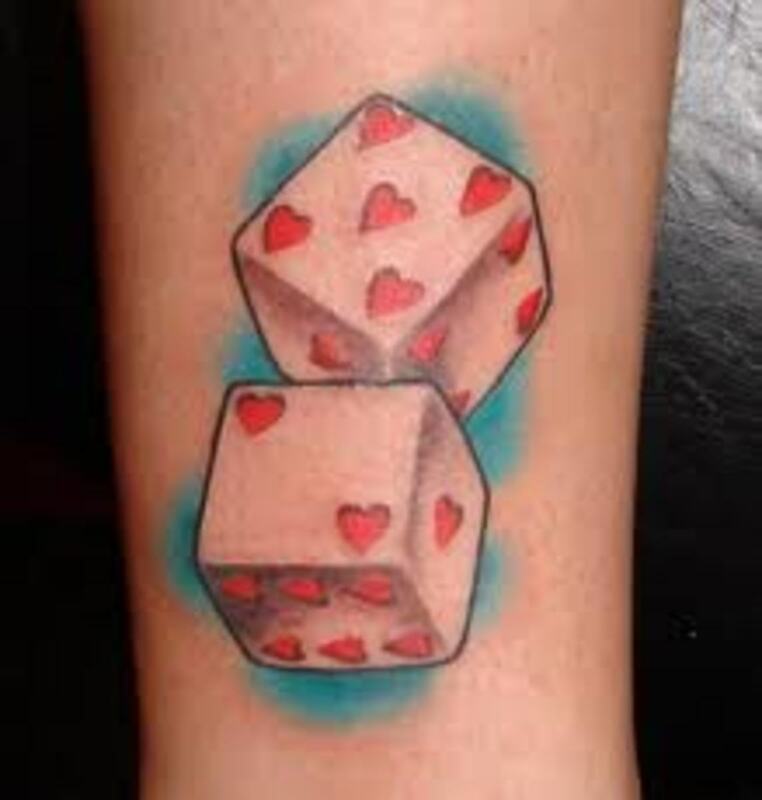 There are not many symbolic meanings for dice, but they have very strong associations. So, those who wear them usually feel their symbolic value to be very meaningful. 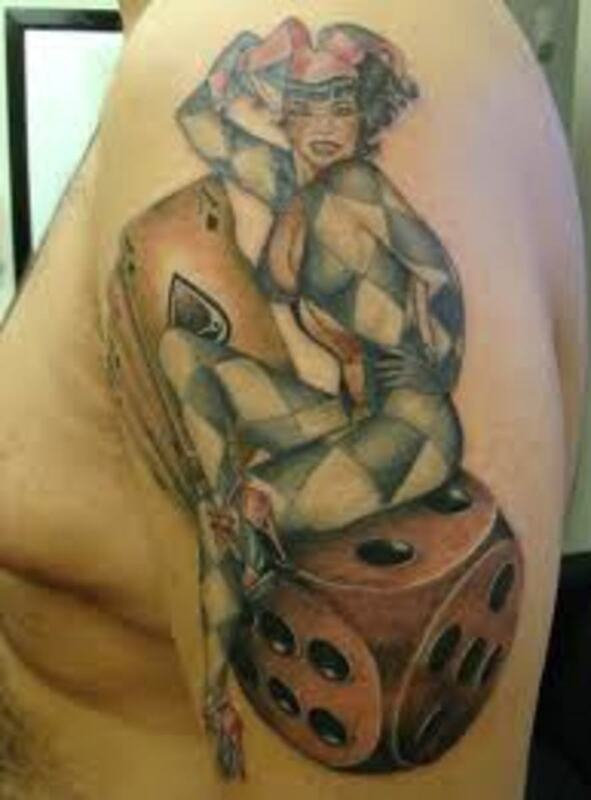 It takes a special personality to fit a dice design. 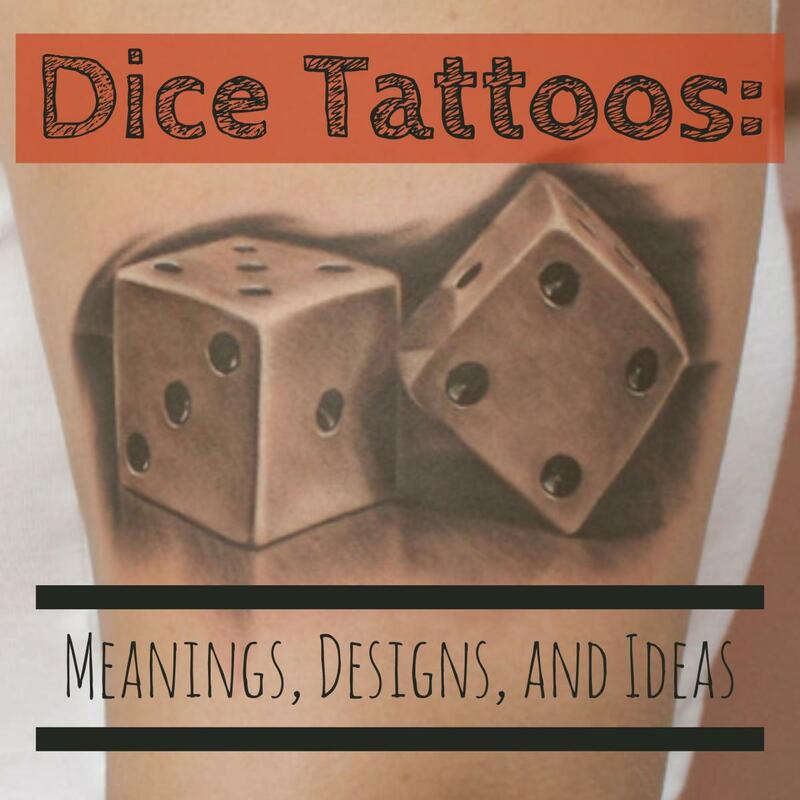 In the table above, you can find common meanings associated with dice designs. 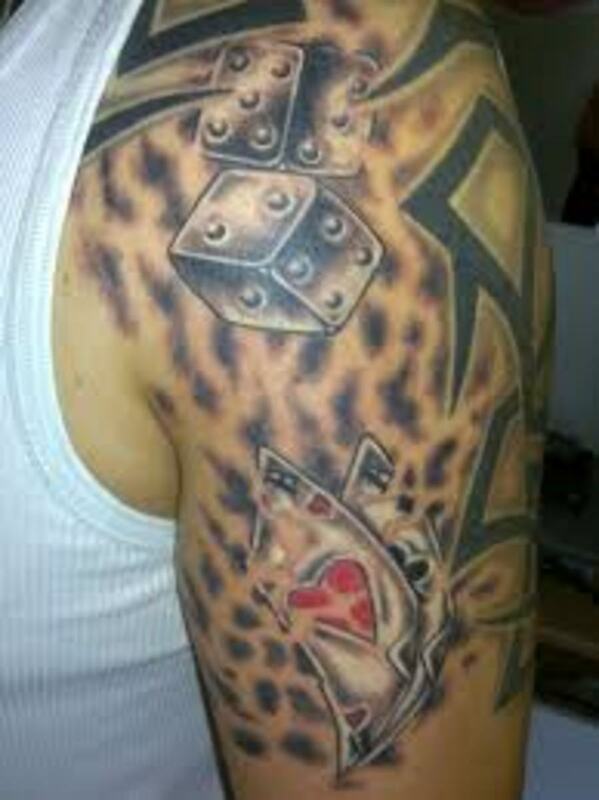 Although the meanings behind dice are few in between, there is no shortage when it comes to awesome designs. 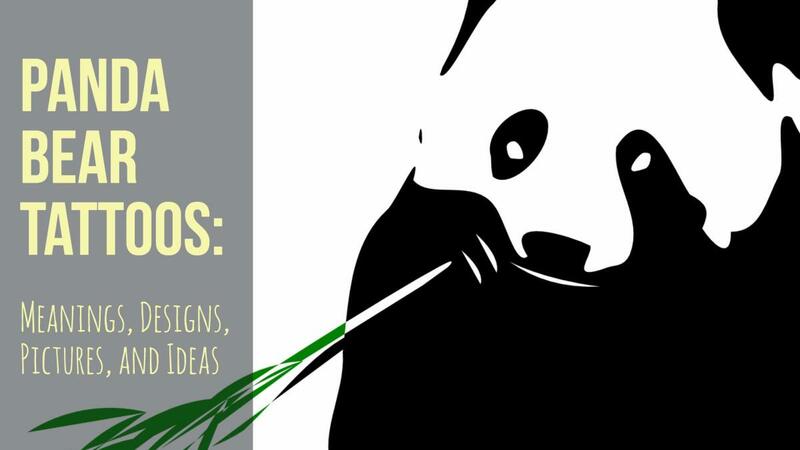 When done correctly with appropriate symbols, they can be some of the most unique designs out there. 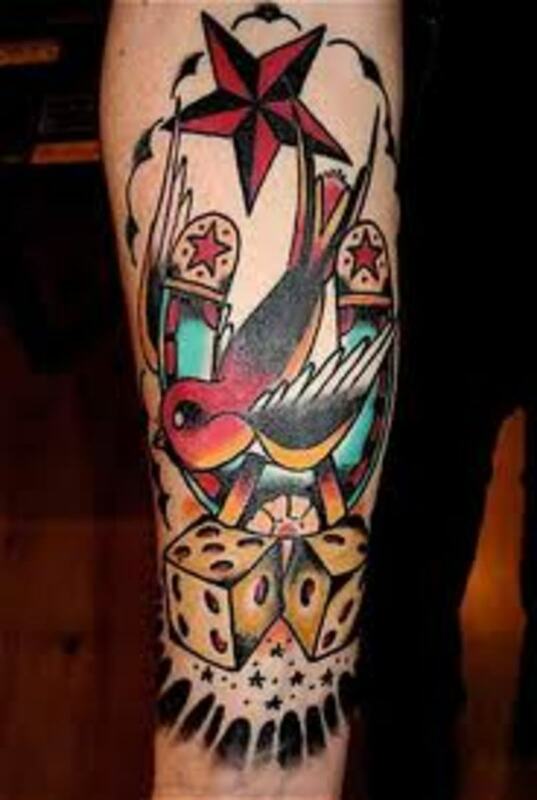 It also takes a special personality to fit a dice tattoo—this is not to say that it can't fit you. 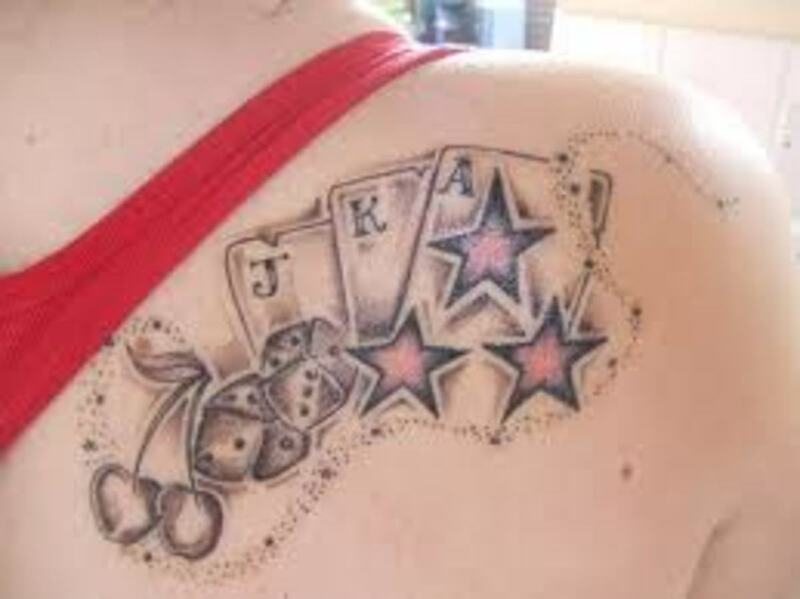 In fact, many people wear this tattoo simply for the cool look of it. Either way, it can make for a great unique design that you can call your own. As you read earlier, there is a lot you can do with dice designs. 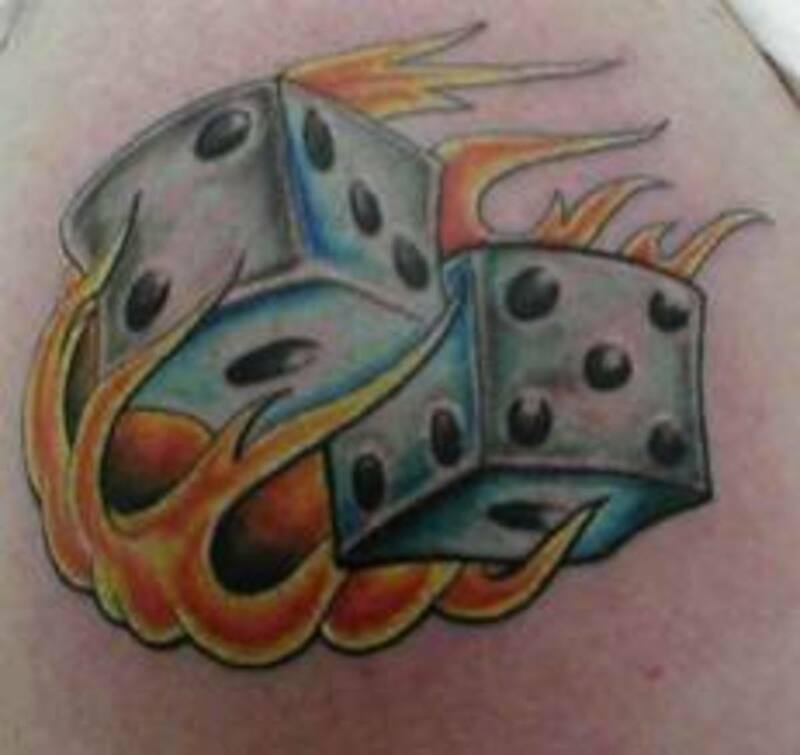 One very popular choice among men and women is flaming dice. It is a simple design, but once flames are added, it is on another level. 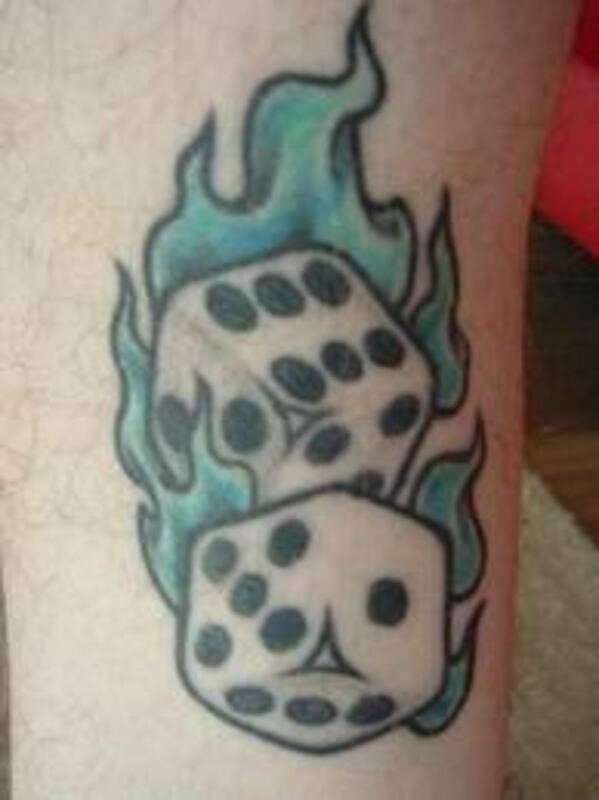 The flames help the dice standout more and it is sure to catch the eyes of others. 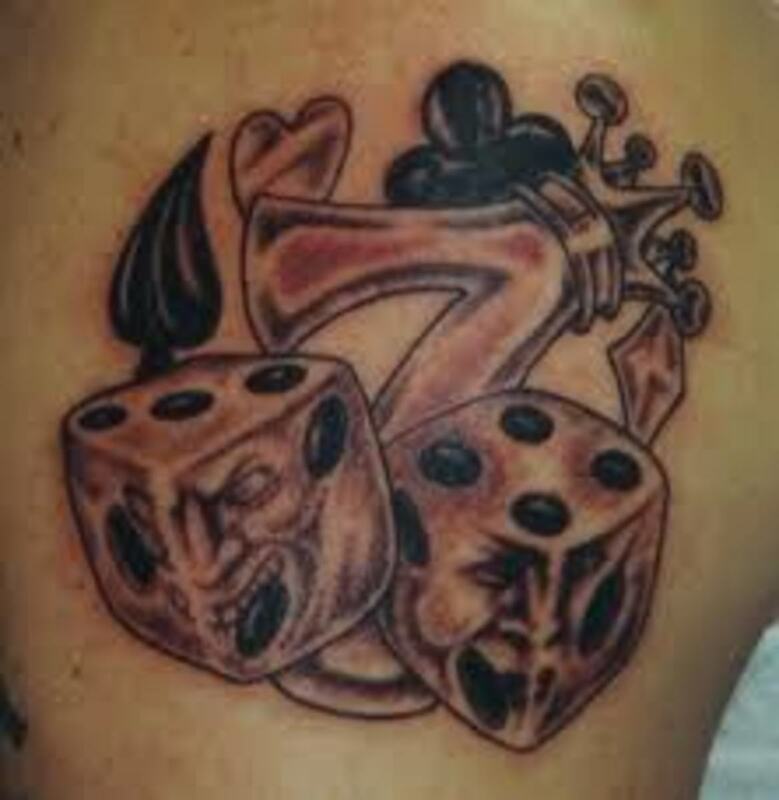 Some people choose to have the dice showing seven, and others choose snake eyes. This is a term that references when both dice are showing only one dot. 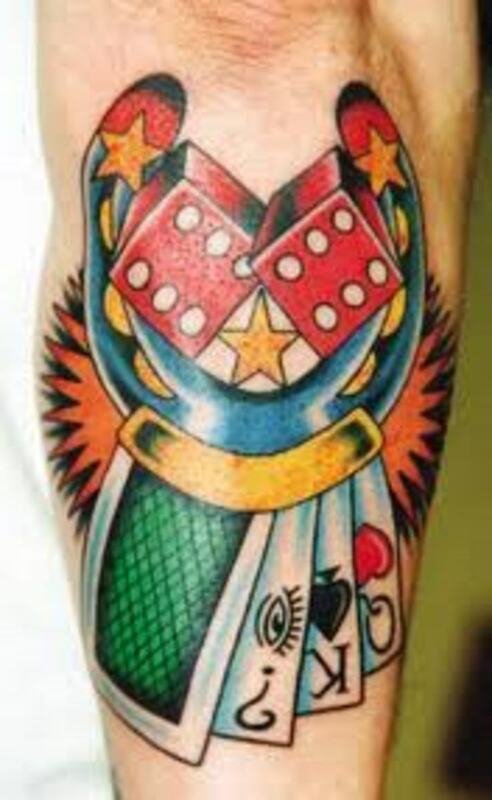 Snake eyes actually represent loss and uncertainty. 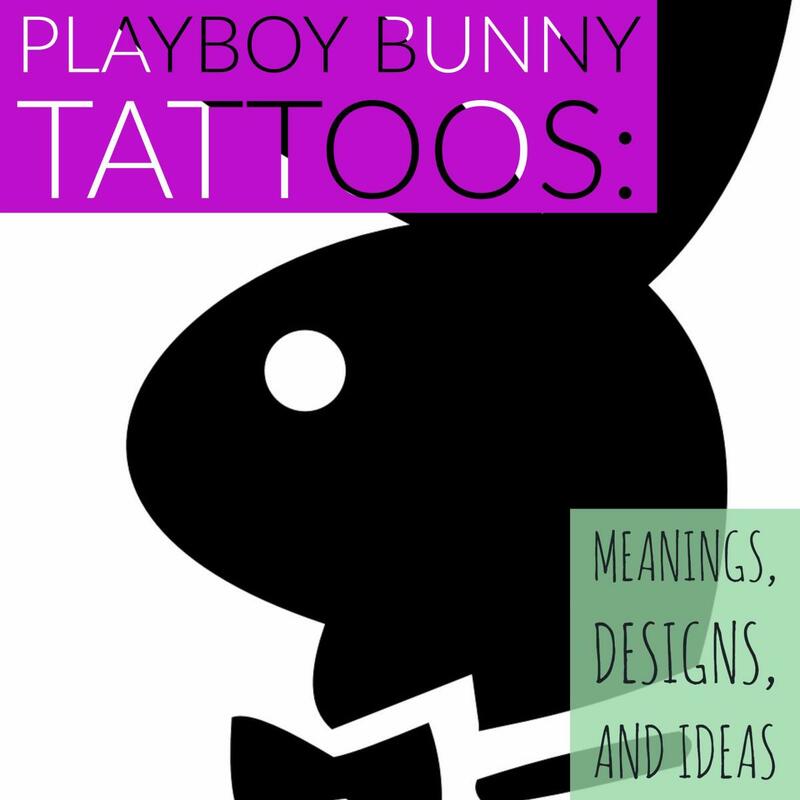 It can be symbolized and incorporated into tattoo designs as well. 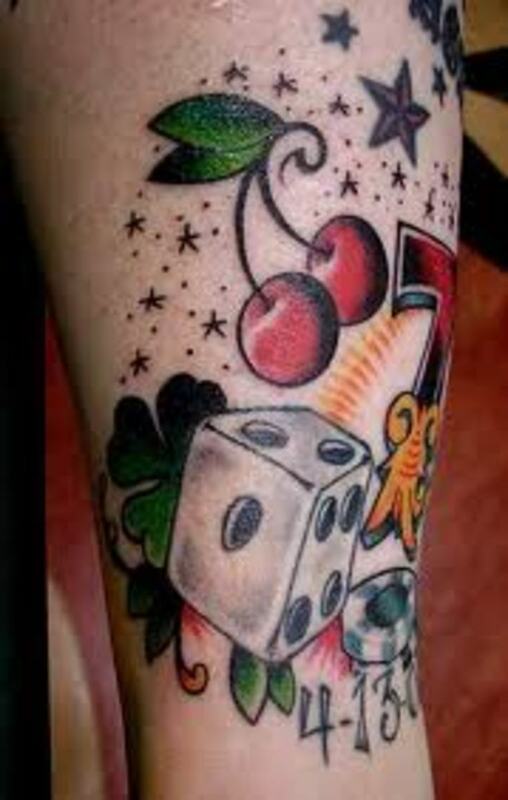 Although the traditional dice is white with black dots, dice can come in a variety of different colors. No color is out of the question, though! 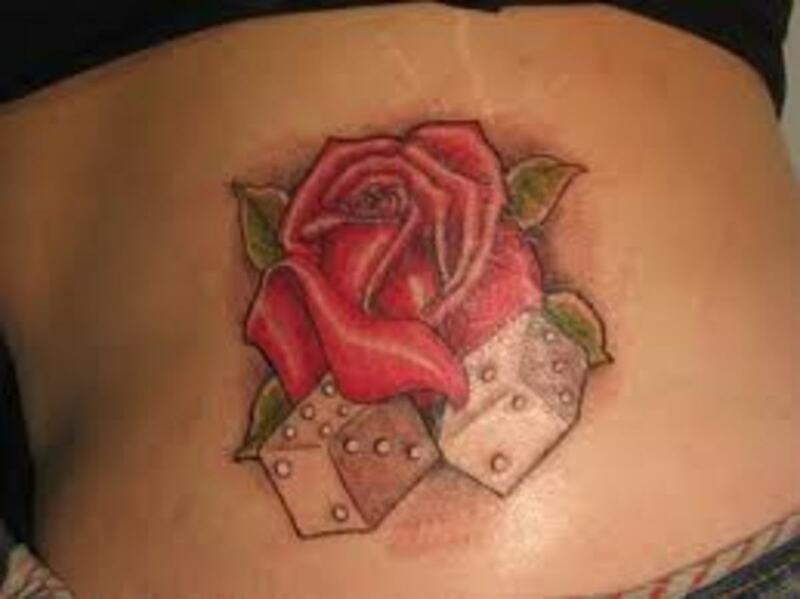 For example, women may choose a white dice with purple or pink dots. 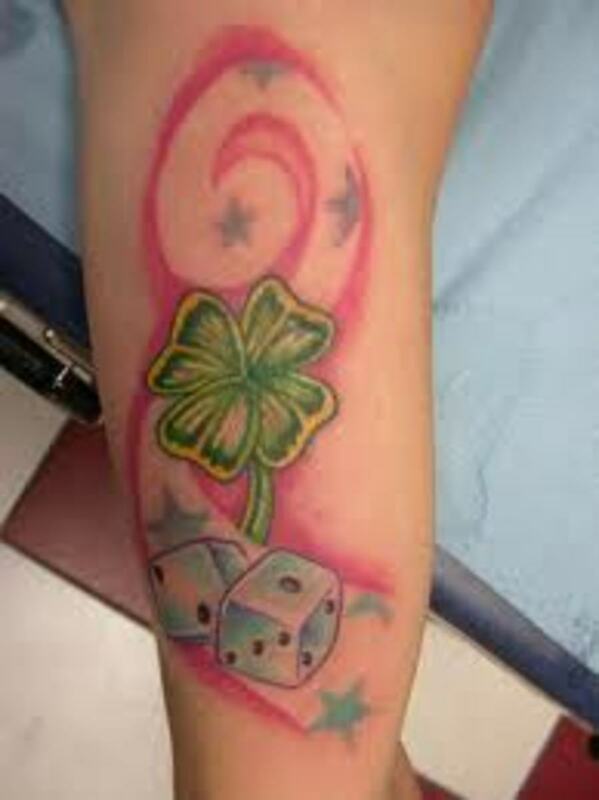 They could also choose a pink dice with white dots. Men tend to choose red or blue dice with white dots—the sky is the limit when it comes to colors. Believe it or not, dice and dice games have been around for a few thousand years. Yep—antique dice have been found throughout most of our documented history, dating back to thousands of years ago. These antique dice were made from a variety of different materials such as bone, wood, stone, metal, and even ivory. Before dice ever hit the tables at any casino, they were hitting the ground in parts of Europe and Asia. 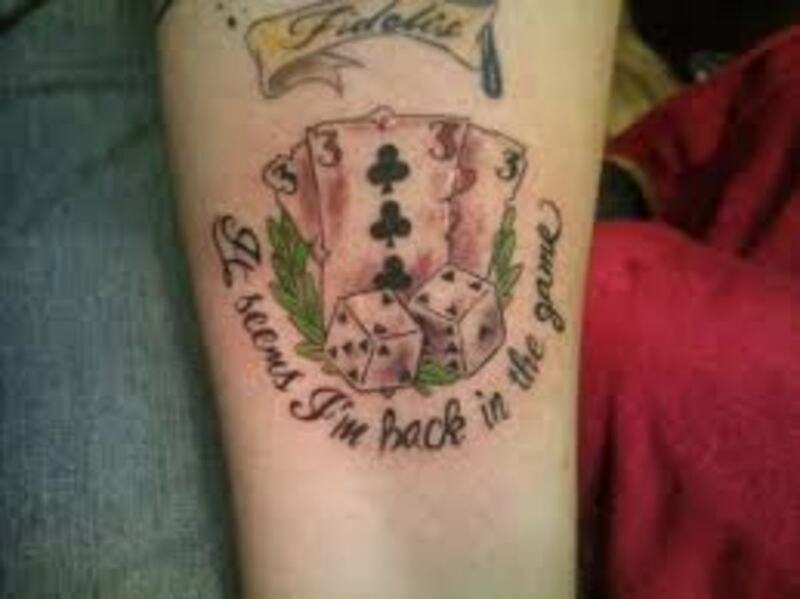 When it comes to dice, nothing is out of the question. 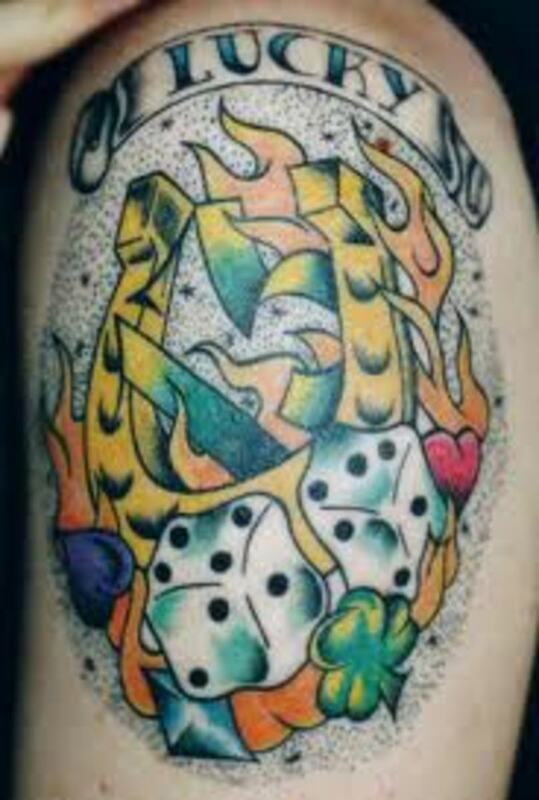 There are so many different variations of dice tattoos, styles, and different symbols that you can incorporate into larger designs. 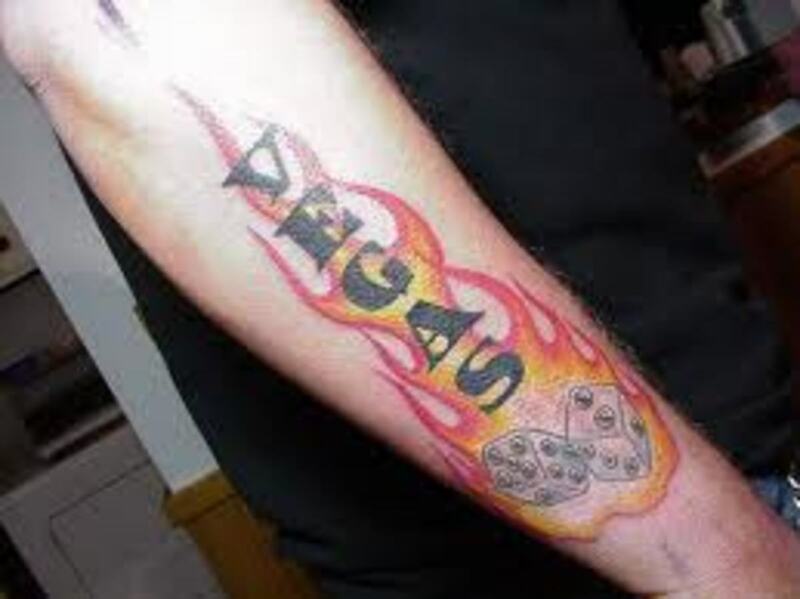 We all know dice are found at every casino and in a variety of board games across the world. Dice are also often seen dangling around rearview mirrors to decorate our cars. 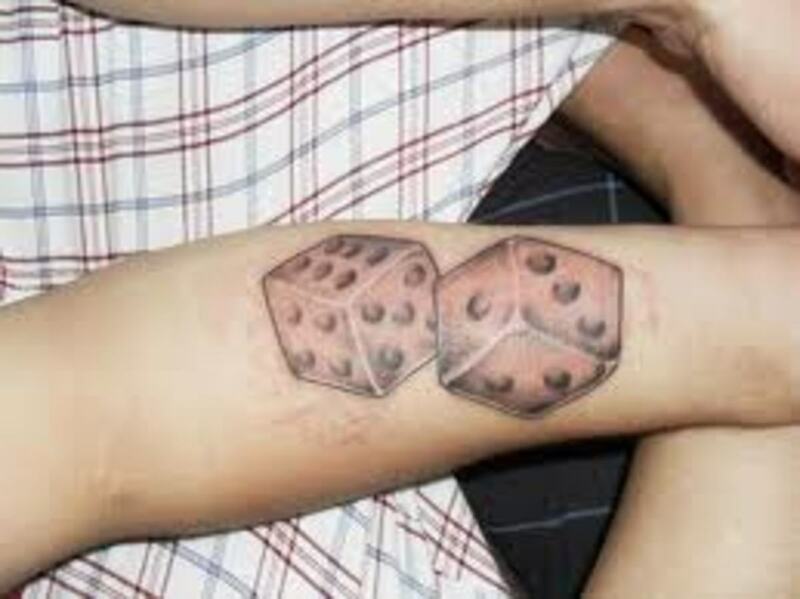 Over the years, dice have been used for a variety of different purposes, but are recognized as a symbol of chance and luck all around the globe. 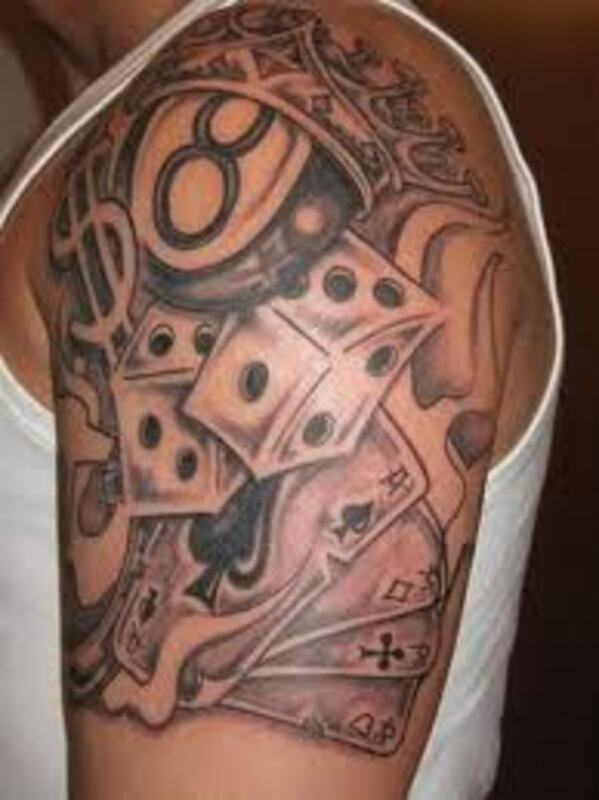 Dice and other gambling designs continue to gain popularity among both men and women who love to live boldly. Most of us know that the dice is square and the square has six sides. Each side of the square is numbered one through six. Each black dot on the dice represents one number. 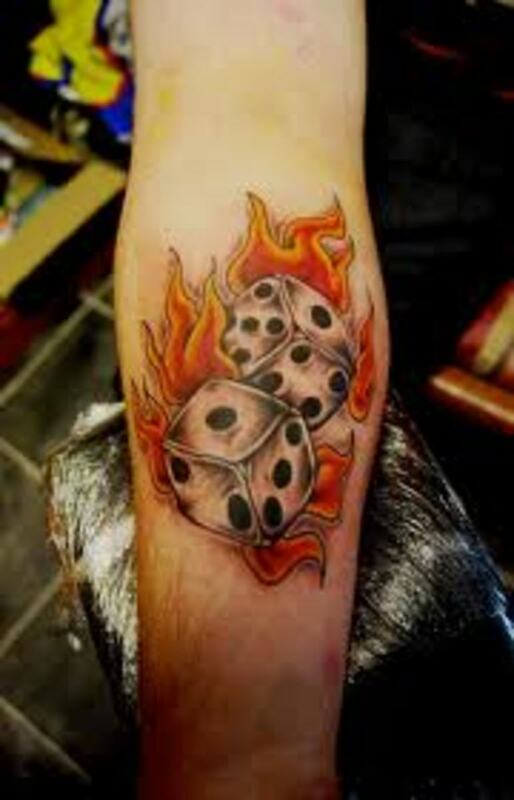 In the casino and many dice games, two dice are used to play. 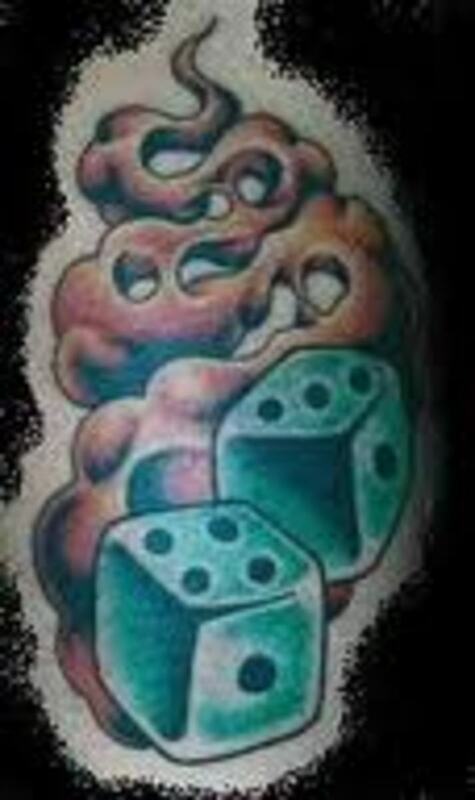 Dice designs often display two dice that have a value of seven—the lucky number associated with playing dice. 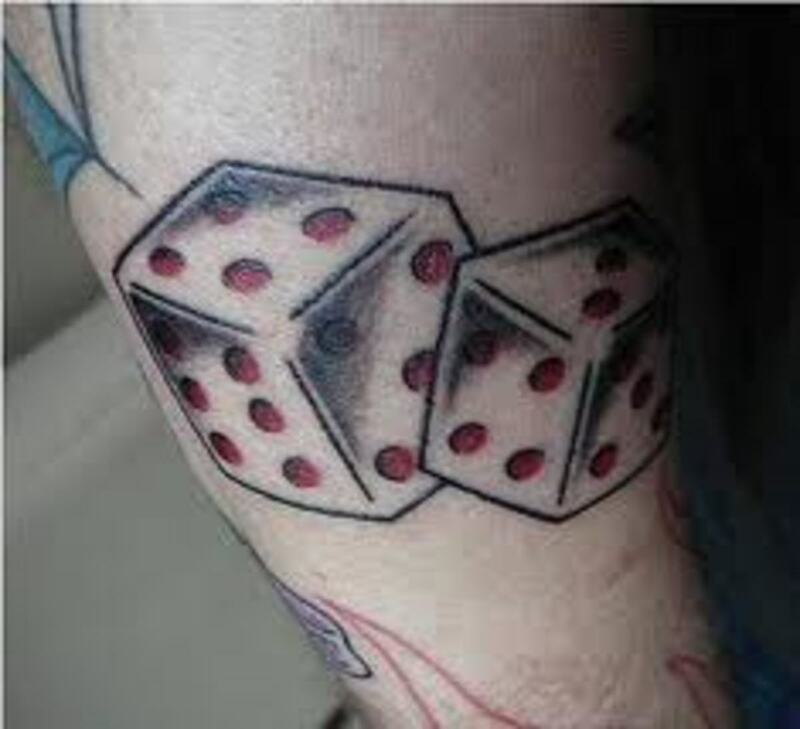 Due to this fact, a dice design that shows seven represents good luck. The number eleven is also considered to be a good luck and represents itself as such. Most of you have probably heard the phrase "roll the dice." This phrase symbolizes taking a chance or taking a risk. 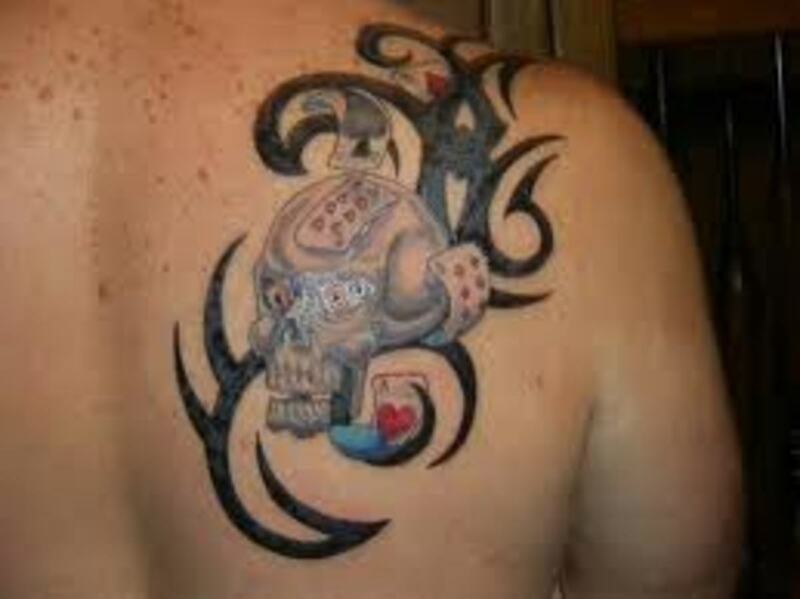 Thus, they can symbolize a risk taker or someone that enjoys danger. Many people actually have this personality where they seem to not care about anything that will happen to them, now or later. 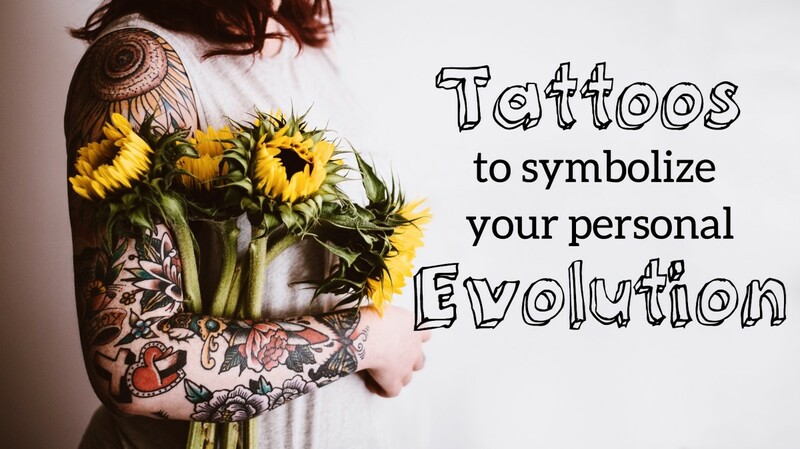 For these people, their design can symbolize these traits within themselves. 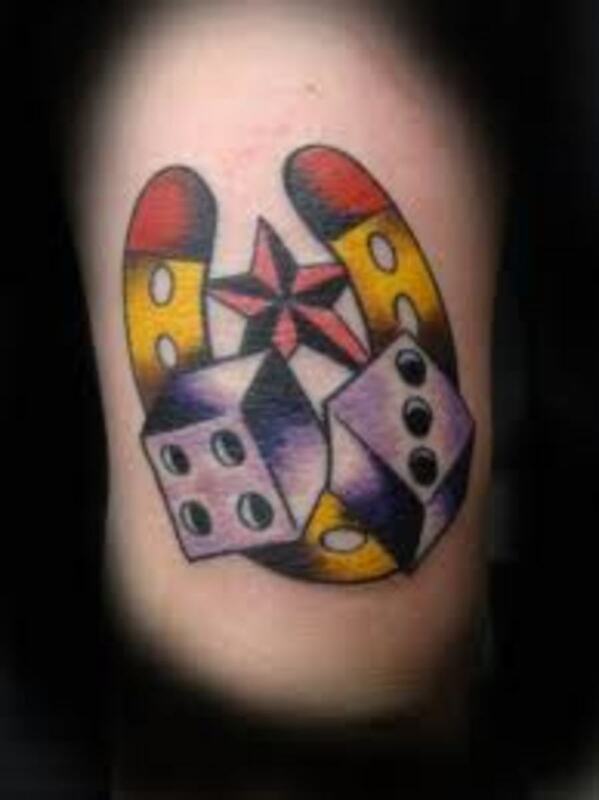 Sometimes these kinds of designs come with dice alone, but in many cases, they are part of a larger tattoo design that can include a variety of symbols. Some designs may include a large portion of all these symbols, which gives you an advantage if you are considering such a design. 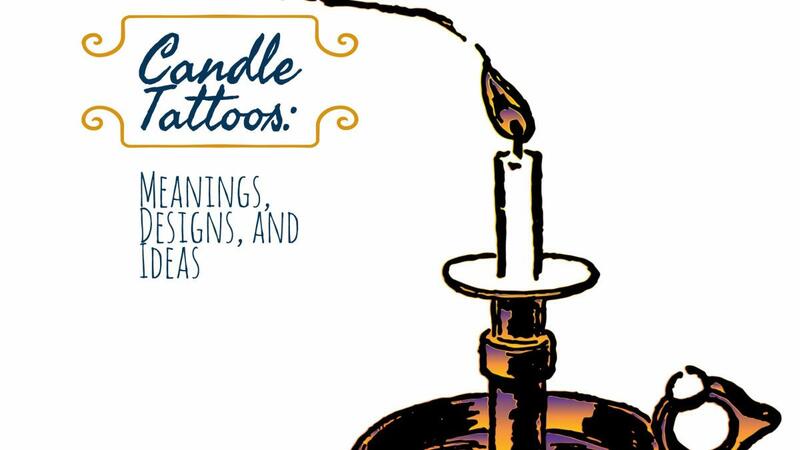 This allows you to be able to incorporate these symbols to make one large unique tattoo. The possibilities are endless. When it comes to your design, you can be very creative. There are some very important things to remember before you choose your design. You want to make sure you do your own research and understand what yours represents and means. You want to choose one that fits your personality and one that symbolizes yourself. Don't rush into the process before thinking everything out. When you rush, we tend to get something that we later regret. Do your own research, take your time, and understand the one that you want. Thanks for your visit, and have fun! Paul, giving your meaning, it makes perfect sense. The main goal, it's meaningful to you and in the end, that's all that matters. Meaningful tattoos will always outshine those inked for no purpose. Sounds like a perfect plan, go for it! Just make sure you come back and post your picture, if you don't mind. Simple, but meaningful and I like that. 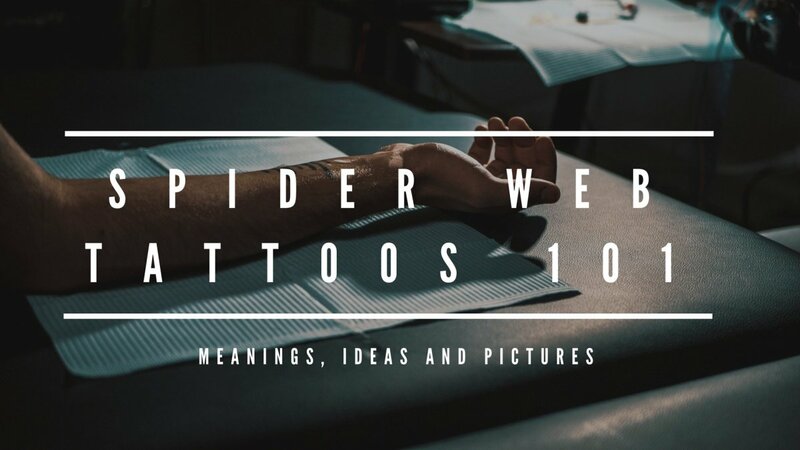 You want a tattoo that you love, respect, and holds meaning. 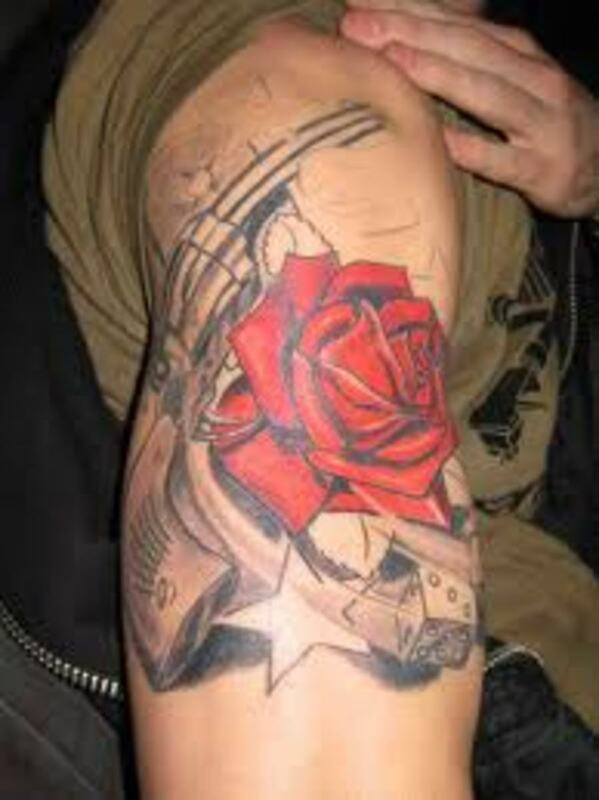 The exciting elements about tattoos, interesting is creative. 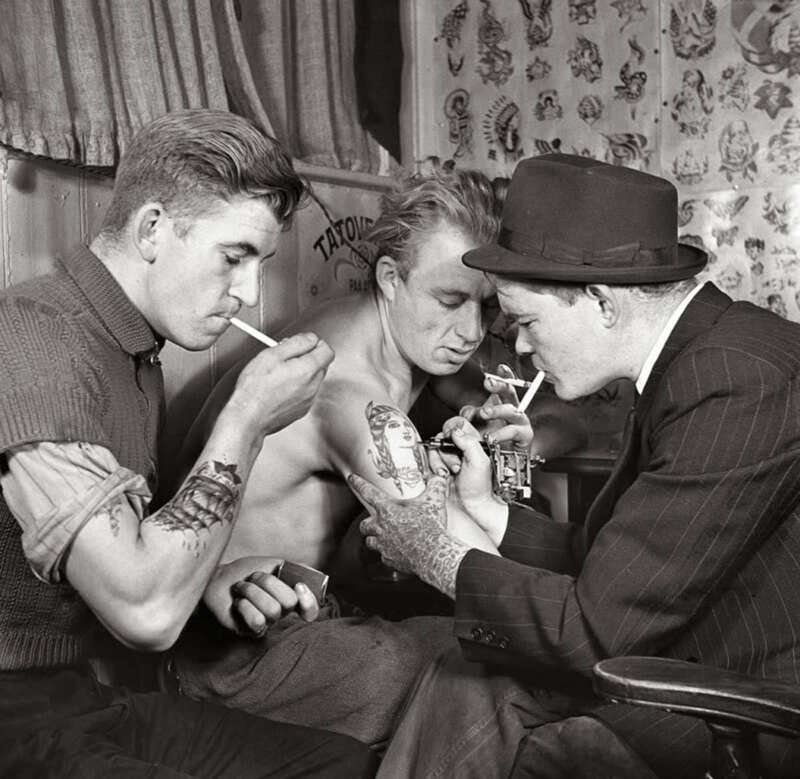 You never know, your tattoo may begin a trend. Paul, if that is what you truly want, go for it! Thanks for the comments and your welcome back anytime!!! 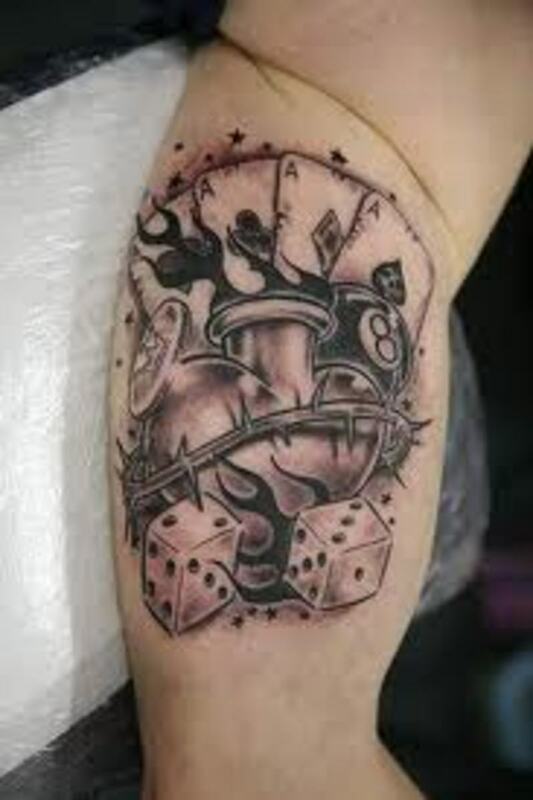 I just liked the dice tattoo with the heart in it and I wanted to get my first tattoo of a dice with hearts in it to replace the dots but the hearts will represent an important date. E.g 3 hearts in one side, 5 hearts in the other side, 6 in the other side.. 3/5/06. Getting the second dice would be meaningless to me as it will represent nothing, hence why I was wondering if it actually makes sense to get one by itself. 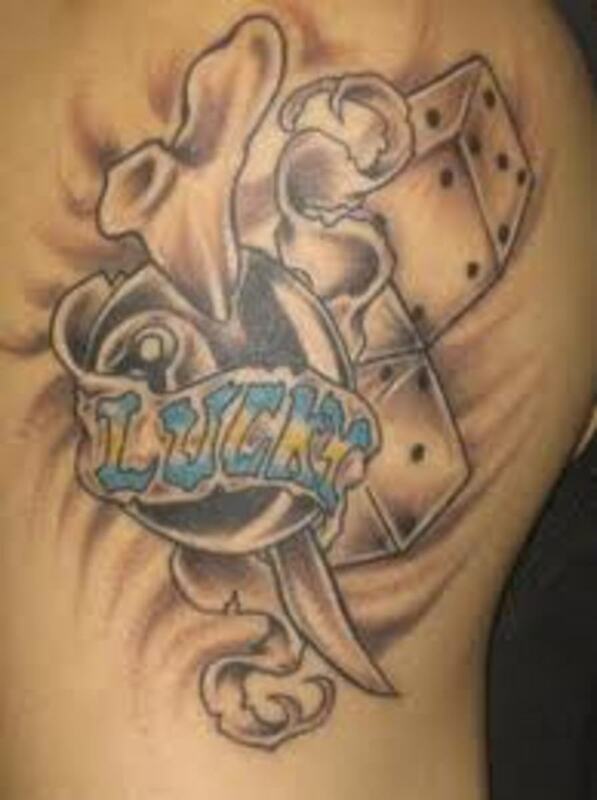 Selle, on average, your around $600 or more for this tattoo. Due to the size and detail, I doubt it would be under $600. Paul, I do see them from time to time. 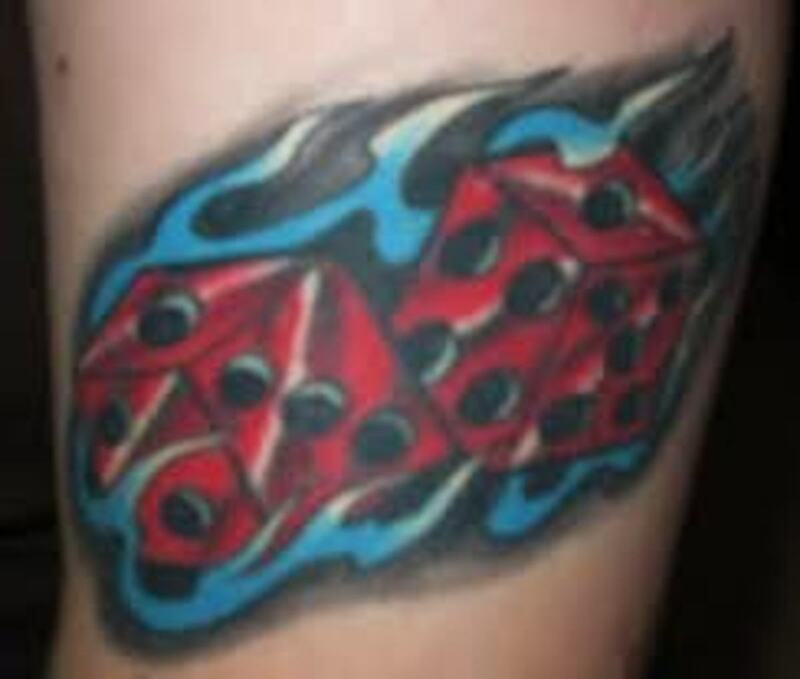 Most dice tattoos portray two of course, but in the end, it is your dice tattoo. 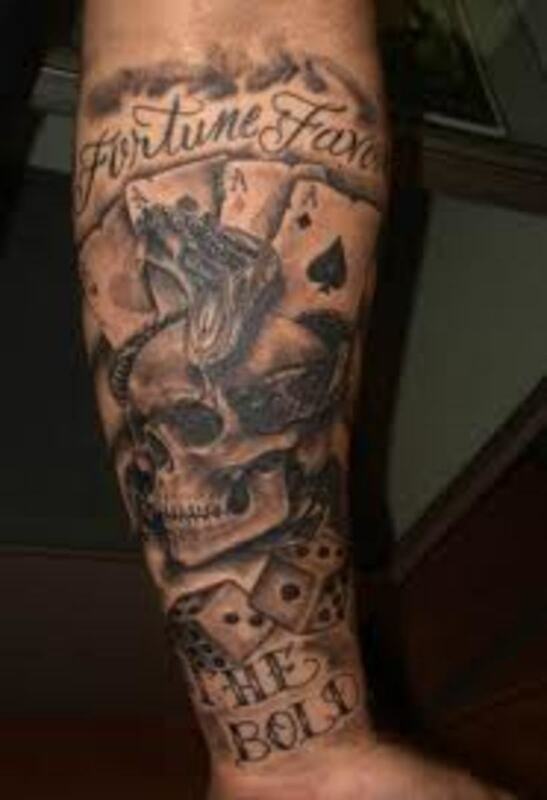 Personally if I was going with just one dice, I would add other associated elements, such as poker cards, cherries, money, poker chips, rabbit, horseshoes, something to that nature. 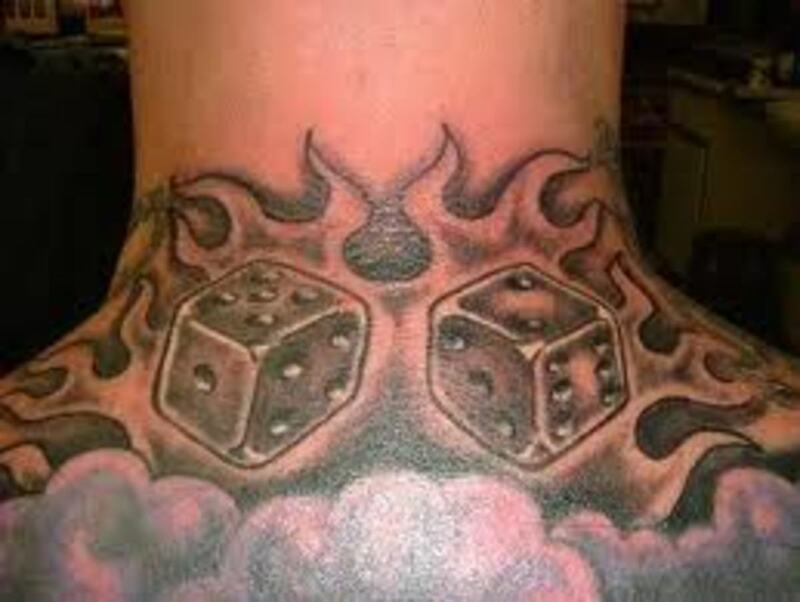 What are you looking for or what is your idea behind the one dice? Thank you both for the comments. 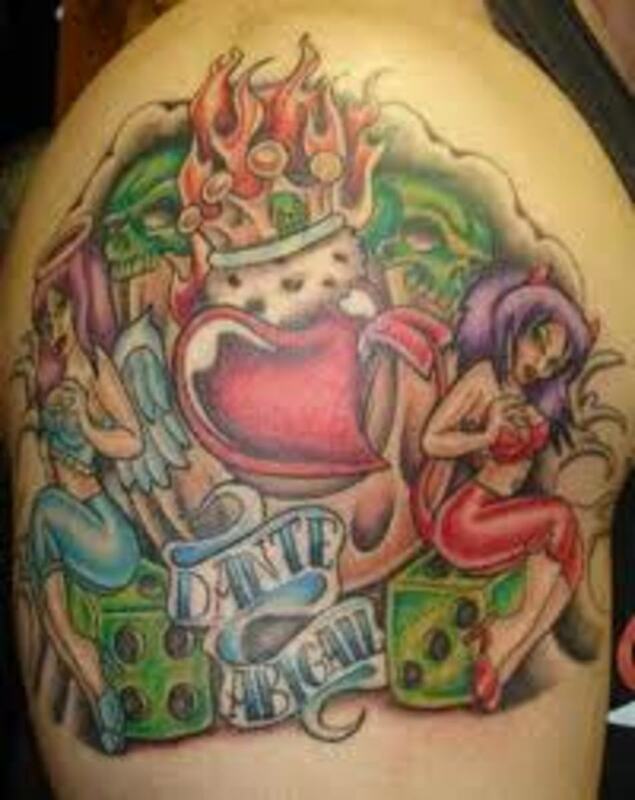 Hi I was wondering if it makes sense to have just one dice..
How much was that 8 ball wif tha crown? *Frank, always great to hear from you pal. Thanks for taking the time to drop by. *Alocsin, thanks for taking the time to come by and check it out. The colorful dice have a great look to them. Very creative and certainly far from the norm. *AE, always a pleasure for your support and visits. That is a creative design. I like it myself. Best wishes. *Kash, thanks for taking the time to read it friend. I am much appreciative. Take care. *Gypsy, my dear, hope all is well. 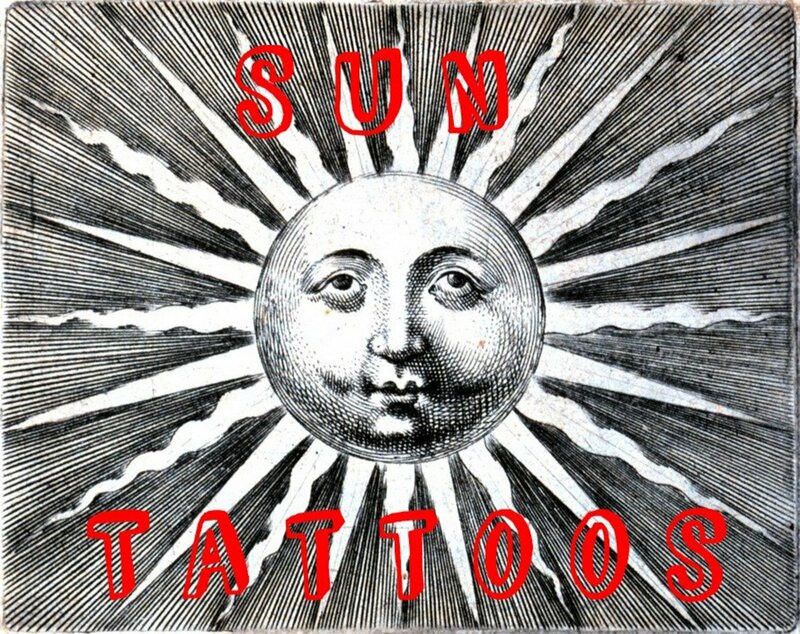 Your right, a great variety for a simple tattoo symbol. These I really like. Nice variety. 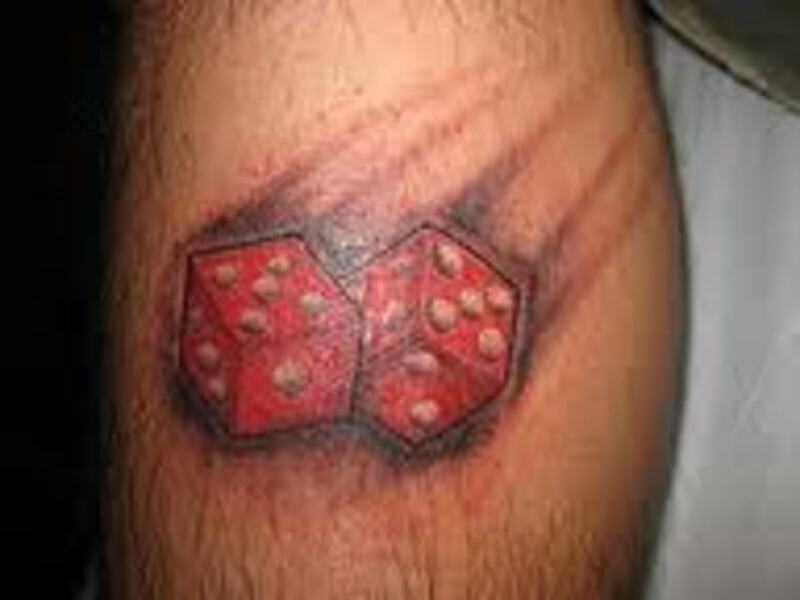 Hi my friend, another beautifully done hub on dice tattoos highlighted by many beautiful photos . I see this a lot, but generally not in the colors you have here -- mostly in black and white. Voting this Up and Beautiful.